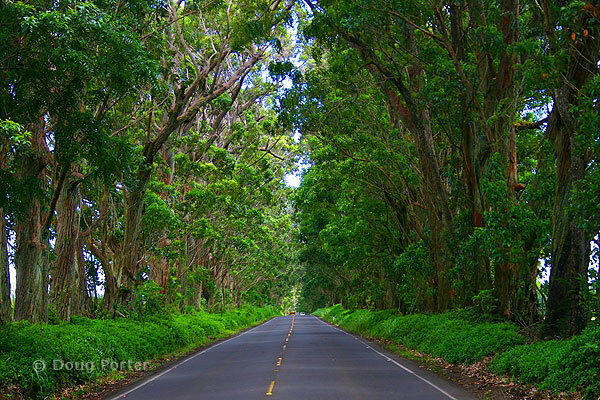 Kauai Tree Tunnel: Kauai's beautiful Tree Tunnel on the way to Poipu, was planted over 150 years ago when the wealthy Scotchman and Kauai cattle rancher Walter Duncan McBryde donated over 500 Eucalyptus trees that were left over after landscaping his estate. The tree tunnel is over a mile long and shades the cars that pass underneath along the highway. The trees that make up the tunnel are called Eucalyptus Robusta, (sometimes also called Swamp Mahogany) and are native to southeastern Australia. They grow to heights of 180 feet or more. The top of the tree tunnel was damaged in two hurricanes; one in 1982 and the second one in 1993 which for many years opened up the top of the tunnel. However, I'm happy to say that the trees have mostly grown back together again and the tunnel has been restored as the above picture taken in 2007 shows. McBryde was successful in lumber, real estate, and banking. He co-founded the McBryde Sugar Company, and managed the Kauai Pineapple Company. He donated Kukuiolono park to the locals, much of which is now Kukuiolono Golf Course. He is buried near the tee of the 8th hole.